#justNYCthings: Manhattanhenge – That's So Annie! I read about the Manhattanhenge, or the Manhattan Solstice, many years ago. 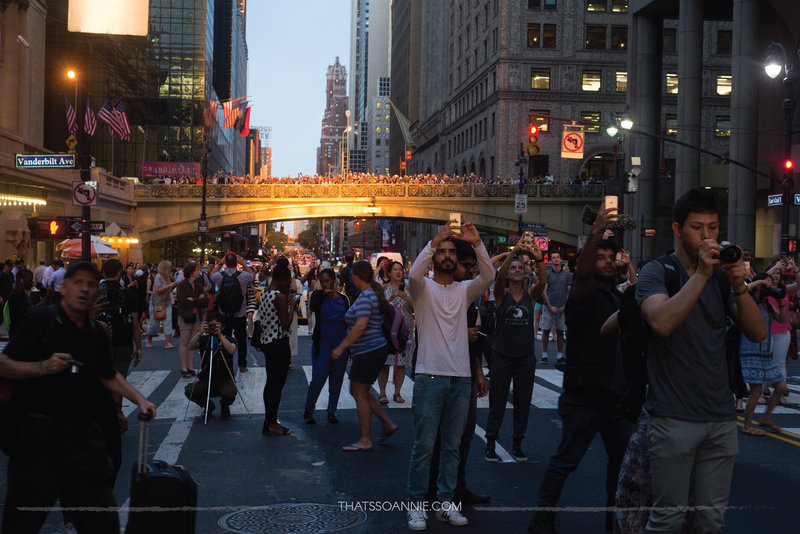 Twice a year the setting sun aligns with the streets of Manhattan, spilling the streets with an ethereal golden light, and hundreds of people gather to photograph this light phenomena. The name of this modern day event, comes from the Stonehenge, an English monument from ~3000 BC, where the setting sun aligned with the stone structure on the summer and the winter solstice. Living in Mumbai meant that, well… NONE of the streets formed any sort of a grid whatsoever. There was never going to be Mumbaihenge so I was looking forward to seeing the famed Manhattanhenge and make a fun day out of it too! When we reached NYC, we realized that there were multiple spots to observe this event from. The popularity of this event meant that there were people converging in these spots from hours earlier. We decided to give it a whirl anyway, and after some running around we ended up at one of the most perfect spots – Grand Central Terminal. On an unrelated note, this lovely train station is one of my most favorite parts about NYC. Twenty minutes before the sun in actually slated to set, the sidewalks overflow with a crowd of people with their cameras, taking the 20 seconds between traffic signals to chart the progress of the setting sun in between the Manhattan skyscrapers. #manhattanhenge with crazy manhattanites ??? See? I told you it was a nuts sort of a day! 🙂 Until next year, Manhattan! Can’t see the picture because office has retards that block Instagram but Manhattanhenge sounds so very cool! The ceiling at Grand Central is this beautiful shade of blue-green, and has the constellations painted across.. it’s gorgeous! <3 Come visit me soon!